Are you unhappy with bread that comes out of a bread machine? Me, too! Here are 5 Surprising Reasons I Don’t Bake Bread in My Bread Machine, but I use my bread machine all the time. Hoping I can change your mind. The bread on the left was baked in a bread machine. 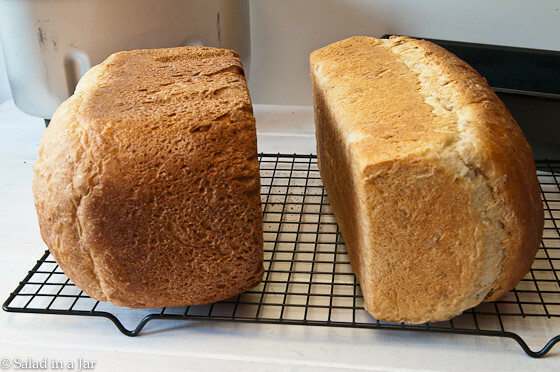 The loaf on the right was mixed and kneaded in a bread machine but baked in a conventional oven. In case you are a new or disillusioned bread machine owner who is just now finding this blog, this post is for you! I rarely bake bread in my bread machine. Make no mistake! I love my bread machines, (yes, I have several), but I use them for mixing and kneading only. After all, isn’t that why people buy bread machines? Check out the pictures, and I think you’ll see my point. The shape is weird when baked in a bread machine. I much prefer the way my loaf looks when I form the dough myself (after the dough cycle completes) and place it into a traditional bread pan. See how the corners and bottom edges are rounded on the left? A bread machine pan is designed that way so no flour will be left behind during the kneading process. The result is a rounded lump of a loaf that doesn’t resemble anything for sale in a fine bakery. Observe the hole-y texture of the crust on the side of the loaf baked in a bread machine. 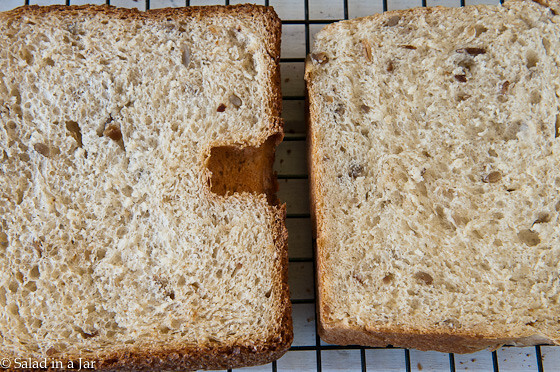 This results in a tough crust–not a tender one like the bread on the right as seen in the picture above. Then there are the holes in the bottom where the blades were. Some people have told me they take the bread dough out of the machine, remove the blades, and put the dough back into the bread machine pan before allowing the dough to rise again and bake inside the machine. But you still end up with holes, albeit smaller ones. If I’m going to that much trouble, I just throw the dough into a traditional loaf pan and bake it up right. The crust is too thick and hard when you bake bread in a bread machine. See the third picture above. If your kids don’t like the crust on bread from the grocery store, they surely won’t like the crust on bread from your bread machine. It’s also a dead giveaway that you baked your bread in a bread machine. Also, compare the texture of the two slices above. It’s subtle, but I think the texture of the bread on the right is slightly more homogeneous and pleasing than the bread on the left. You lose control over the timing when you allow the bread machine to bake your bread. I don’t have a picture of this, but it can be the most important reason of all not to bake in your bread machine. Because yeast is a living organism, it can be a little unpredictable depending on the ingredients in your recipe and the ambient temperature. The timer built into the machine doesn’t make allowances for this. Sometimes, the machine will automatically kick into the bake cycle whether your dough rises the proper amount or not. If the dough has not risen enough because it’s the dead of winter and your kitchen is cold or the machine is sitting in a drafty place, you may end up with a small, heavy loaf. If it’s the middle of the summer in Texas or your recipe calls for a lot of sugar, the dough may rise too quickly resulting in a finished loaf with a big dip in the middle. What a disappointment! Using whole grains can be especially problematic because the rising time usually takes longer. Some machines have a special whole wheat cycle but again, it is automatic and may not work for your particular recipe. p.s. In case you are now wondering why you even need a bread machine, I highly recommend them for convenience and unmatched kneading ability. See the related posts below. All that stuff you are complaining about a bread machine loaf don’t bother me. It is the taste after it comes out of the bread machine. These things just don’t mix the dough well enough to suit me turning out a yeasty tasting loaf of bread. So in a bowl, I decided to go with the hand method mixing the dry ingredients good first than adding the wet ingredients to the dry ingredients mixing them really good and then kneading my bread dough for about 20 minutes. The finished bread tastes unbelievable good and that is all I care about. Because it gets to be work to knead bread, I found a nice stand mixer that was reasonably priced and with a double dough hook that simulates the hand kneading. Therefore my bread machine is going to Goodwill. I’m all about the taste and texture, too. You are right that some machines don’t do the best job of mixing. Sometimes they will leave pockets of flour in the corners. The early machines and some of the cheaper models can be guilty of this sin. I’m curious what brand of bread machine you were using. At any rate, I’m glad you have worked out a method you like. Since none of our kitchens, equipment, or priorities are the same, it’s something we each have to figure out for our particular situation. 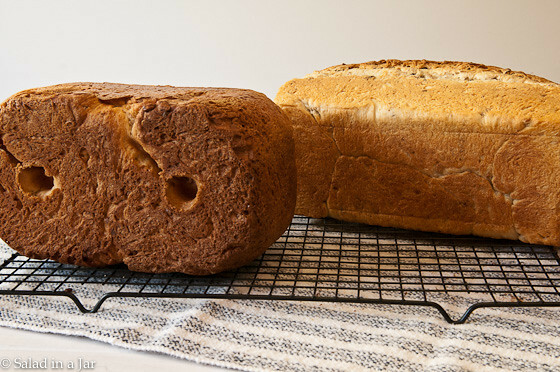 Making your own bread does seem like a tricky thing to do without your proper equipment. It is good to know that it would be smart to know that mixing bread with a timer can be very helpful. That does seem like a great thing for me to know because I want to try to bake more bread. keep up the good work and thank you for the facts that you have shared with your article in here. I’ve been making bread machine bread since they came out. I am like you. I tried a few times in the machine and my kids didn’t like the crust. I started using the dough cycle and it has been great. I usually make the 2 lb. loaf size, shape into 3 free formed french style loaves Bake at 375 for around 15 min. My kids think it’s the best. Ps. I’m a mom of 9. Now, I think that a bread machine should be like a slow-cooker. Only use it when you want to put everything in and come back hours later to something ready. A bread machine, much like a slow-cooker, isn’t some miracle machine that lets you dump everything in and have a beautiful meal finished just like the traditional way. You only use it when you either have something that’s better when it’s made in the machine, or when convenience is a concern. For certain dishes, a slow-cooker is better, but in general it’s only good for a fraction of recipes. For the rest, use pots, pans, and an oven. It’s the same for bread. I think I understand the point you are making. However, I think a bread machine does a better job kneading bread than the average person does by hand so I recommend it over the old-fashioned way to most people. See this post. Oh, absolutely. I do think a bread machine is much better at kneading than I will ever be. I just believe that a bread machine is only good at kneading most of the time, so that’s what I use it for. Specifically roil out dough to a 12 to 14 inch by 5 inch rectangle, then fill lightly careful to each end,fold/ roll over. -then bake cycle 30 min . Comes out good , but not as well as a jelly roll filled dough in a conventional oven. I realized I had typed cake instead of BAKE cycle , which in a toastmaster bread machine allows a “up to 60 min” baking cycle. –	and fill with any filling,( lightly) and roll it. So, …Just thought to follow up. Then bake for 30 min on the cake cycle and turn off. It will continue to warm for 30 min depending on your machine. Comes out great without the blade hole and a softer crust because of the shortened bake time. I totally agree with you, about not cooking the bread in the bread mechanic. I received my bread maker about 15 years ago now, and I can tell you I only ever cooked one loaf in my bread maker!! I didn’t like the way it looked and had a very hard time getting the mixer part out of the bread! I put it away for a long time, but than starting thinking it would be good just to mix and proof the bread in the bread maker, which saved me time doing this myself. My only problem I have with the bread maker is that I can not find a recipe for crusty breads or roll, as that is what my husband and I prefer. Do you have any recipes for crustier bread or rolls?? I also love crusty bread. Try these rolls. This loaf is also crusty. And then there is this French bread. Happy bread-making! bread machine kind of girl. Arm with your tips & and expertise, I too will ” knead in the machine & bake in my oven”. Thanks again for sharing. I bought a bread machine because my husband has congestive heart failure and has to eat low sodium. So far I’ve had good luck eliminating the salt altogether and using just a little Light Salt (which is potassium, so still have to be careful). I will have to try baking in the oven. Since it’s just the two of us and I don’t really eat bread, I only make 1 lb loaves so they don’t ruin before he eats a loaf. I have only made oatmeal bread so far and look forward to trying other grain breads. Donnette, I can related to baking bread for two. Usually means I eat way too much myself. Making small loaves is a great idea. Thanks for your blog!! I got the same bread machine you have for Christmas!! Was hoping however that after having had a bread machine over 20 years ago (my only one that broke after a year); that the problems of the past would have been fixed?? Uneven or limited browning on top, too much air in crust, poor texture & tough crust. I have cooked two loaves so far and it didn’t brown, was tough and texture ok. Will the manufacturers ever get it right so you don’t have to use your oven?? What’s the point? I love to cook but all inclusive was something I was looking for? Any tips for those of us wanting to conquer the machine itself and cook in it too?? If I am going to double a bread recipe do I need to double the time on the dough cycle? I am only kneeding it and them making cinnamon rolls. This is an EXCELLENT question. Make two separate batches. Your machine is most likely not designed to handle more than 3-4 cups of flour in one batch so it would not do a good job kneading a double batch. So make one recipe and when it is done kneading remove the dough and put it in a bowl to proof. Then make another batch and let it knead. This is why I have two machines. One is cheap and old but it still does a good job mixing and kneading. So glad you asked. Just found this site. Thank you for such an informative article! I have been baking breads (among other things) for over forty years. I never desired a bread machine. My husband wanted to try one. Some loaves come out great and some are so-so. I hate the holes and everything else you mentioned. I wanted to try using the bread machine for just the kneading and your article gave me the confidence to do so. (One day I hope to own a huge Kitchen Aid mixer. I have my grandmother’s Kitchen Aid from 1950 and it is still going strong but I use it sparingly) I quickly skimmed your site and I think it is fantastic. Thank you for sharing your expertise and knowledge. I would never, never, buy a loaf of bread. I use the machine as you say-kneading & proofing then baking in the oven. My question: how do I get the top to be as light as the bottom? I want a loaf without a crust. Thanks Paula: I have tried using foil lose & it works some. I will try the lower shelf. I’m hesitant to lower the temp from 350 to 325, etc because 55 minutes exactly cooks perfectly. I’m not sure how to determine how long to cook @ a lower temp. I just made a loaf of bread today in my machine and I totally get the darn sunken hole thing inside. and i never knew why!!!! How do you transfer the dough to the pan to bake it? how long and temp and so on? Kimberly, Check out this post for answers to your questions. Do you have other receipes using the bread maker just for the kneading process, then the oven for the baking? Looking for cinnamon bread, herb bread, and even other savory breads utilizing cheese, etc. Thanks! I need help. I received the Oster breadmaker as a wedding present and have tried to make bread twice. Both the times were disastrous. I followed the instructions very very carefully, but no success. the second time the dough did not take the shape of the bread pan and came out in the shape of a mountain. What am I doing wrong ! Very very frustrating…. I just found your recipe for bread machine Oatmeal Sunflower bread that you baked in the oven. Can’t wait to try it because I hate baking bread in the bread machine for the reasons you listed. I have 2 questions. Do I have to use bread flour? Is it possible to make any bread machine bread and just set it to Dough setting then take it out, let it rise and bake in the oven??? Thanks again for posting this great recipe. I have used my bread machine for the first time yesterday and pretty well happy with the results but take your point about the shape. I want to bake a 2lb brown loaf in a conventional oven but have no idea at what tempeture or how long to bake. I would appreciate any advice. I read some stuff here before I used my breadmaker which helped and have added this site to my favourites. Thank you for the advice and tips. Check out this post to get your started. I have a Gold Star bread machine that was given to me, I only want to use it to knead the dough. I want to use the recipes in the book, but the book doesn’t tell me at what temperature I need to set my stove or how long to bake it for. I have never made bread by hand so I wouldn’t be able to assume at what temperature from a previous experience. So could you possibly post temperatures for baking bread & maybe some rolls. Pamela, There are several variables so I can’t give you one temperature. Check out this post for more guidance. At what stage of the bread machine process do I take the loaf out to put into my oven bread pan? 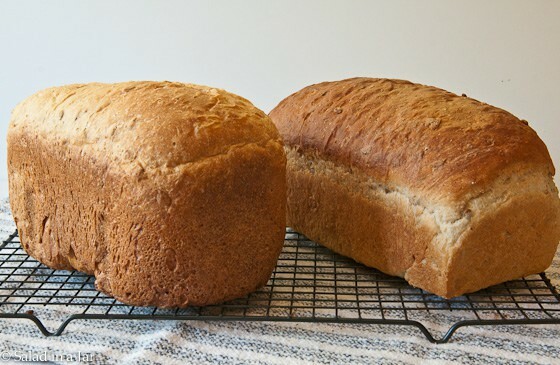 Hi, I think I have the same Zojurishi bread maker you have, and I made our sandwich bread with a combo of whole wheat and all-purpose flour, but I stopped using it, because my kids didn’t like the crust. Great idea to bake it in the oven. Here are a few questions: I am new to the science of bread making. If I use the dough cycle and let it rise in the bread maker, how do I know when it has risen enough? It does beep with the dough cycle is done, but not risen enough. and once I take it out and form it in the loaf pan, does it need to rise again before baking? What do you recommend for greasing the loaf pan? Thank you! Your dough should double in size during the first rise or by the end of the dough cycle. If it is not double when the dough cycle completes, let it continue to rise. It would probably help to find a warmer place for your machine, especially in the winter. I often make bread in our laundry room as it is the warmest room in the house. After, the first rise, gently deflate the dough, form it as you desire, and let dough rise again until nearly double, then bake in your conventional oven. I like to grease my bread pans with Bakers Joy. See this post for more complete instructions. I just got my first bread machine, its a Panasonic and has the yeast dispenser on the top. I have stopped baking my bread in the machine and doing what you suggest, baking in the oven. Most machines have a beep feature close to the end of the kneading cycle which tells you when to add dried fruits and/or nuts. But since I often miss the beep, I usually add them in by hand before I roll out the dough. Works fine. This recipe smells great, it will be ready to come out of the oven in about 5 minutes. I’m using convection and doing 2 small loaves, as all i have are a couple of 3 1/2 x 8 meat loaf pans, but it seems to be working fine. Will post in an hour with results 🙂 thanks for the recipe! My wife is super excited to taste it. Sure was! Im here to use the recipe again… My kids went silly on the stuff! I added pumpkin seeds and used whole wheat flour last time…. Awesome. You bake in the oven even in the summer? I was actually thinking about just using my bread machine to cook the bread during the summer, that way my oven doesn’t heat up the house while I fight to keep it cool. Check out this post for the answer to your questions. Happy bread eating! New machine user…how long and at what temp do you bake the bread after it’s removed from the machine. I had a bread machine when we lived in California, and its performance was adequate, but I was always uncomfortable at the expenditure of energy for a single loaf of bread. We moved to Colorado, and I found that whole-wheat bread baked at an elevation of 7800 feet resulted in something we could have used to pave walkways, even though I added extra white flour or pure gluten. I much prefer to mix and bake several loaves at a time, and after I developed tendinitis in my hands I gave up kneading by hand and invested in a Cuisinart stand mixer, which does a great job. So no more bread machine for me. We live in the forest and don’t need to have anything paved. I have a bread maker, and I use it to make dough for Broetchen, kolaches, breads, and anything else I can think of,but I also never bake anything in it. If memory serves me right Broetchen is the name for Kaiser rolls that are round instead of shaped from a strip of dough. I have made Kaiser rolls from my regular white bread dough that I make in my machine and the turned out great. I have moderate arthritis and had almost quit baking bread until a friend gave me her machine that she no longer used. At first I faithfully followed the directions and baked it all of the way through even setting it to have hot bread in the morning, until I woke up to find that the dough had over flowed and I had a real mess. Then I got smart and started to do it like you do. Now, I bake at least twice a week and I will never be without a machine again. I love having it do all the work and only having one mixing pan to clean up;. Now, if only I could find a recipe for Schnitzbrot that I can make in my marvelous machine I would be a happy camper. Have you tried my Really Crusty Rolls? Probably not the same as Broetchen but similar. fruit bread. My little German grandmother made it every Christmas and I was the only one in the family that ate it. It was wonderful. Since she was a dump cook, with all of her recipes in her head, she was never able to pass them on. She also made great big Bavarian pretzels every Saturday and I have never had any as good as hers. I strongly urge everyone to write down their recipes and give them to your children or someone you love so they are never lost as hers are. The bread you are talking about is really lovely. We had an elderly lady who lived near us in London. She would always say how wonderful my grandmother had been to her when she arrived from Germany, befriending her and giving her things. My grandmother an Irish immigrant had very little then but but felt rich in comparison, as Ruth had even less then my grandmother and had lost so much. I believe the first thing my grandmother gave her was Soda bread – half of what she had. She did that, from then on with every thing she had which was little. Ruth, said my parents had continued what my grandmother started and continued to be very good and helpful to her. Ruth was a Jewish refugee and we were Catholics she spent every holiday with us – including Christmas and Easter! And LOVED ST Patrick’s Day!! She was a real character … I called her Aunt. We were blessed with her wonderful breads at these holidays and at Christmas there was always Schnitzbrot. She would let me – only me – help her and gave me her recipes. which she told me. was the most precious gift she could give me as they had been passed down through all the years and different women in her family. Now its me who still makes her special breads on those holidays – I don’t have a bread maker – and we always cut the first slice and put it on her plate at the place set for the missing that we can’t see, then we pray for her and for the other women in her family and ours, many of who perished in dreadful circumstances; we remember them. She told us she always brought us bread because bread is life and sacred. I think of her every day. My Grandmothers name was Grainne meaning Grace … which is very fitting I think for the person she was. I’m sorry for this long message I had no intention of telling you all this when I started, however, I somehow had to to pass on this story of two amazing women who had both suffered terrible things and were brought together by bread. Now, the main reason for writing this was to say, if you put Schnitzbrot in to a search engine you will find many recipes for it and I dare say there will be one for use in a bread machine. Failing that you could use a bread maker just for the kneading and then oven bake. Which I think dear Ruth with prefer! God bless all women who make bread and continue to sustain their friends and families. What a great story! Thanks for sharing. You have some great traditions going on here–as well as many good memories. I haven’t tried Schnitzbrot yet but I hope to soon. Thanks for writing. I totally agree with you Paula, though I don’t use a bread machine any more for my dough, I hated the way the bread baked in the machine looked and tasted. It’s quite amazing seeing the difference in your photos! After just 2 uses you bread machine went out? Hope you got your money back. I personally couldn’t live without one though. Very convenient kneading machines–that’s what I call them. 🙂 Thanks for writing. Thank you so much for this. It’s like a light went on over my head. All of the things you highlight are reasons why I don’t LOVE my bread machine. But now I can again. I’ll just think of it as a bread mixer/kneader. THanks! You have inspired me again! I had given my machine to my sister to try, but after 3 years she had never used it, so I asked for it back. I haven’t gotten around to using it again, but I hope to this week and do it the way you suggest. You are such a good teacher and I so appreciate your efforts on your blog. Thank you Paula! Thanks Vicki. Comments like yours make all the trouble worth it. Happy bread eating! Thank you for a great blog. I’d wondered about getting a bread machine but I’ve always had great results using my KitchenAide mixer for kneading the dough, so I put that thought aside. I don’t know anyone who has a bread machine so didn’t know about the rounded edges or holes. Thanks for the great class on breadmaking. I’m glad you brought up using a Kitchen Aide. It also will do a beautiful job, especially if you are an experienced bread maker and know what the dough is supposed to look like. Also good if you are making a recipe with more than 3 cups of flour and refrigerator doughs that don’t really need to be kneaded. However, a GOOD bread machine is easier and more convenient in my book for most breads. A lot of it is what you get used to–like anything. :-). Again, thanks for writing. If you are happy with your Kitchen Aide, probably no reason to get a bread machine. I like bread machines for the convenience (my dough cycle has a timer) and the ability to proof right there in the pan. That way, I can throw all the ingredients into the machine and come back an hour and a half later and it’s ready to form into loaves or rolls. Don’t have to move or cover it to proof, and don’t have to decide if it has kneaded long enough. Kitchen Aide is a tiny bit more trouble in my opinion, but not that much. It is also good for recipes with more than 3 cups of flour–a definite limitation with a bread machine. EXCELLENT post!! I’ve been using a bread machine for several years and just recently began doing things the way you posted. Have been MUCH happier with my results!! 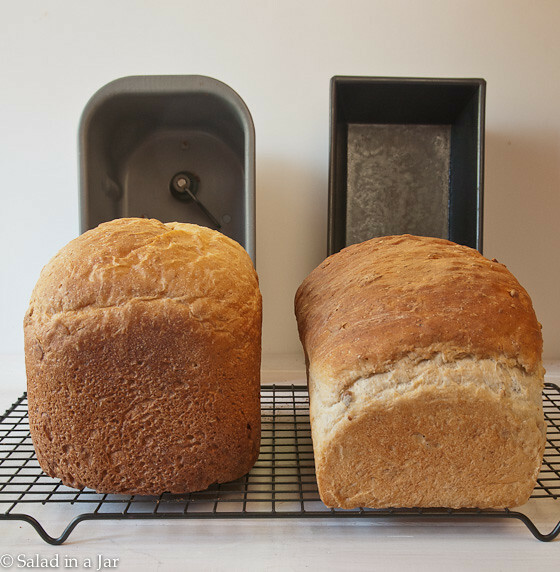 I recognized all of your reasons, except the last one as differences I had noticed, but I never thought that the “automatic-ness” of the bread machine could be the reason for the many inconsistent results I get – especially when baking with whole grains. Thanks especially for that extra piece of information!!! Sounds like you have come to the same conclusion I have. I don’t bake with whole grains much but it can really be dicey with a bread machine and the timing when you start playing around like so many of us like to do. Good to hear from you. Looks like I will have to experiment with the potato water and beer. Interesting. I love using potatoes in my bread for the long-lasting quality they impart but have not tried using the water.